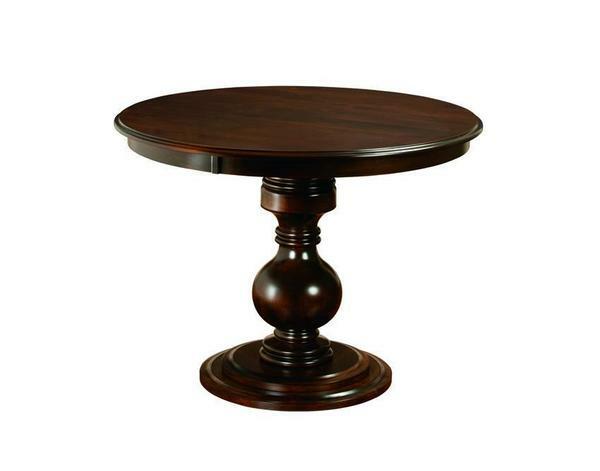 Pub table height just right for your nook or dining area, the Amish Stanton Single Pedestal Pub Table makes quite an impression. There's some formal flair here with a round bulb in the curvy base that stands on a fancy platform that's circular and sensational. Enjoy pub height for every dining experience from casual to formal. The Stanton is also available as a standard height dining table. The Amish Stanton Single Pedestal Pub Table comes from the Bontrager Dining Collection, creators of unique dining tables that are true works of art. Pick the options you like best for your new table on the options page. Samples are available to help you pick just the right wood and stain for your dining room or kitchen. Our Furniture Specialists are here for you. Email or call us today. Thank you for shopping DutchCrafters.